April 8 - Viewer has spotted the Osprey twice in the nest. March 27 - Osprey Webcam went LIVE! CLICK HERE if you was to view 2015-2018 Camera Updates. Ospreys are flying back to nest for the summer and the Town of Osoyoos has front row seats to the show. A camera has been installed to watch over a nest discovered on a FortisBC power pole. When they found the nest, FortisBC crews de-energized the pole to make sure the birds will be safe once they return home (the switch, will not affect customers’ electric service). FortisBC and the Town of Osoyoos saw an opportunity to use the nest as an educational tool. The idea was to set up a camera and stream a live feed of the ospreys. But there was a catch – the team couldn’t install a camera on the power pole. If there were any adjustments to be made, FortisBC power line technicians would be required to ensure they were done safely – creating an inconvenience for everyone involved. It wasn’t long before a solution was proposed – mount a camera on a separate pole near the nest for optimum viewing and convenience. FortisBC crews went to work, and completed the task. FortisBC also provided funds for the camera equipment. The Town of Osoyoos would like to take this opportunity to thank FortisBC for the cheque received in the amount of $4,200 to make this project a reality. Click on the FortisBC icon to learn more about Osprey Nest Management Program. Did you know Canada supports one third of the world's osprey population? wingspan is 1.6 metres. Like other birds of prey the osprey has powerful sharp talons and a hooked beak for handling their prey. The main predator of osprey eggs is the raccoon, while the great horned owl sometimes kill osprey chicks and adults. Their hunting abilities are quite dramatic, as they are able to dive into the water from a height of up to 40 metres. The osprey has sharp spines on the soles of their feet that enable them to grasp their prey. When the osprey catches food their opposable outer toe is able to rotate to allow for better aerodynamics while in flight. Male Osprey provide most of the food for the family while the mother remains at the nest for much of the summer. Osprey feed almost exclusively on fish. The Pandionidae family has one species of osprey, and this particular species of Osprey thrives in most parts of the world (except the Polar Regions). They breed commonly in most areas of Canada and the United States and these birds migrate up to 8000km to South and Central America. Osprey breed in Canada between April and September. Their eggs are incubated for about 40 days. Chicks fledge in Mid-July when they are about 2 months old, however they remain close to the nesting site for another three weeks or so dependent on the parents for food. Female adult Ospreys have a pattern of brown feathers across the white chest. This is sometimes referred to as a "necklace." The male's chest is plain white. The female is often larger than the male. Other than those details, the male and female look alike. Osprey live close to water bodies with a rich source of food and they are commonly found as scattered pairs in the interior of Canada and United States. Osprey are adaptable birds and are able to nest in natural and artificial structures close to water including at the top of dead trees, hydro poles, duck blinds, microwave towers and navigation light towers respectively. Since osprey are at the top of the aquatic food web they can be regarded as an indicator of the health and productivity of an ecosystem. If an area is polluted with certain chemicals, animals that are lower on the food chain may digest small amounts of that chemical. Animals such as the Osprey, are at the top of the food web, and will accumulate more toxins in their bodies, a term known as bio-accumulation, therefore, larger animals like Osprey, can effectively determine the condition of the natural environment they are living in. An increase of organic chemical such as the PCBs and DDTs can lead to decline of Osprey population through egg shell thinning. Ospreys resemble bald eagles, but Ospreys are smaller. Ospreys have white bellies. Eagles do not. Ospreys have dark bills. Eagles have massive yellow bills and yellow feet. Ospreys mainly eat fish. They hover, then dive feet-first into the water to catch them. Ospreys are also called Fish Hawks. Eagles sometimes steal fish from Ospreys. Ospreys can be mortally wounded in the process. Ospreys usually eat their catch in a high spot with good visibility all around - for example, on a branch in a tall dead tree. It is not wise to stand below and behind the tail end of an Osprey. It gets messy. 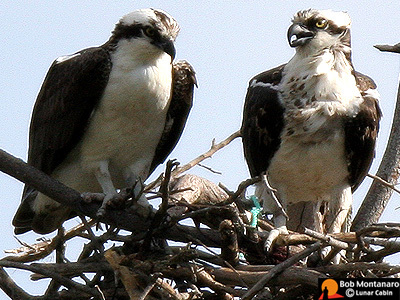 Ospreys return to the same nest year after year, reinforcing the nest each time. Ospreys sometimes build their nests on man-made platforms, on lights above stadiums, on top of signs, or in other high places. If the Osprey nest is in a tree, it will usually be a deep nest, so you might not see the young until they are quite large. Ospreys usually have 2 to 4 young in the spring, and the eggs are laid a couple of days apart. The male and female Osprey take turns sitting on the eggs. The adult Ospreys use their bodies and their wings to shield their young from the hot sun and harsh weather. Ospreys feed and train their young for months. Both adults care for the young Ospreys. When they feel the time is right, the parents withhold food and call to the young from nearby to encourage the young to fly. Adult Ospreys have yellow eyes. Young Ospreys have red eyes. Immature Ospreys have white edging on their dark plumage which creates a scalloped effect on their backs. Adult male Ospreys and young Ospreys have plain white chests. Adult female Ospreys have a brown pattern on their chests. It is often called a "necklace." Adult female Ospreys are usually bigger than the adult males. Ospreys are very protective of their young. They often swoop at perceived threats, including people and cars.